This blog is dedicated to Inspirational American Historical Adventures. Here you wll find featured historical adventure novels, real stories about adventures in history, information about my current novels, my musings, and an occasional short story. So kick your shoes off, prop your feet up, and get ready for adventure in our nation's turbulent past. 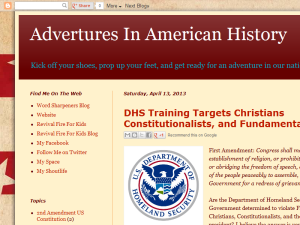 This what your Faith Filled Historicals for the Adventurous Heart Blog Ad will look like to visitors! Of course you will want to use keywords and ad targeting to get the most out of your ad campaign! So purchase an ad space today before there all gone! If you are the owner of Faith Filled Historicals for the Adventurous Heart, or someone who enjoys this blog why not upgrade it to a Featured Listing or Permanent Listing?